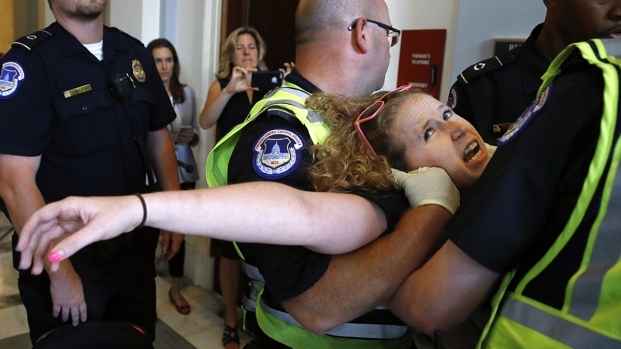 Capitol Police removed protesters, many of whom are disabled and use wheelchairs, from outside Senate Majority Leader Mitch McConnell's office after text of the GOP Senate health care bill was released Thursday. Video of the protest showed the protesters being carried away by police officers as they chanted "no cuts to Medicaid." Empty wheelchairs remained in the hall after the arrests, the video shows. President Donald Trump's $4.1 trillion budget proposal for 2018 also includes $600 billion in decreases to Medicaid, apparently on top of health care bill cuts. Medicaid provides health care not only to the poor, but also to elderly and disabled Americans, who account for 60 percent of the cost.